« All persons are entitled to quality education and training that fully respect their cultural identity » says article 5 of the Universal Declaration on Cultural Diversity, the most relevant international instrument concerning the right to education. This text highlights two priority aspects of education for the international community. It is a matter of quality and respect of identities and thus inclusion of all members of the political community, and not only persons with disabilities or with special needs. 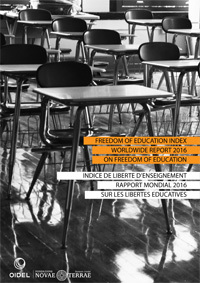 Our research tries to deepen this issue –identity and inclusion- by analyzing the countries’ situation compared to the international norms regarding the liberties linked to the right to education. The recent Incheon Declaration emphasizes this with relevance and urges States to turn to « participatory governance and coordinated partnerships at all levels and across sectors, and to uphold the right to participation of all stakeholders». (UNESCO, 2015, par. 12). The 2016 report covers an important number of countries, 136 in total, from all geographic regions, offering a global panorama of the current situation. You can download the document (12 Mo) clicking directly to the image.